It's official. I've been bit by the organization bug. My mind is abuzz with new systems or ideas to bring more order and efficiency into our life, hopefully leaving time for more creativity and relaxation. Some of the ideas are for better family daily practices. Others are just so that certain spaces of my home are more visually appealing to me... the psycho clean freak. I was talking to a friend on Friday about how certain visuals just are relaxing. A series of books on a shelf that all match. Each author with his volumes together. Sigh. I love going over to her house and enjoying her bookshelves. I'm pretty sure she has four floor-to-ceiling shelves full of classic literature just in the first two rooms of her house. My reader heart just feels at home when I walk in the door. So Saturday I looked for a small project that would make a big impact. My baby doesn't sleep long.... at all. And often certain things irk me, but I never take time to organize them. So I just walk by them, day after day, and get frustrated. So yesterday's project was dum da da DA..... 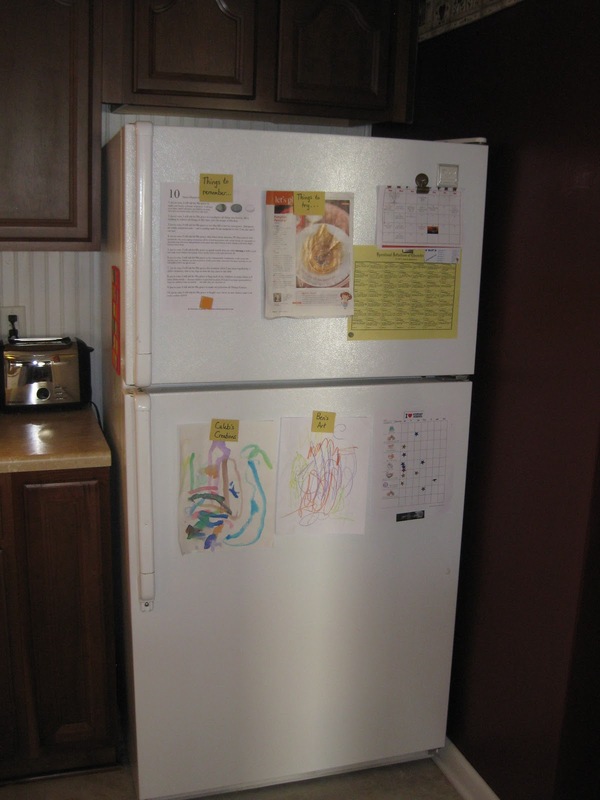 The outside of the refrigerator. I wish I had taken a "before" shot. 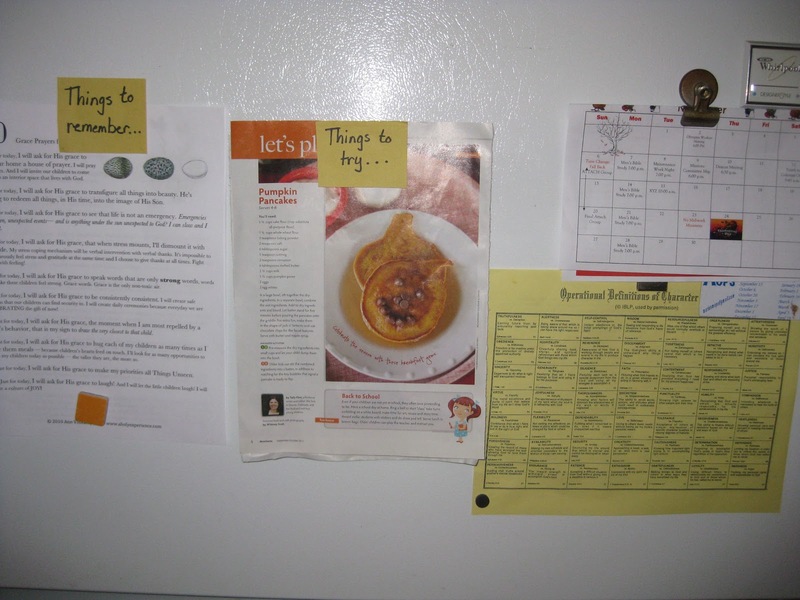 There were Sunday School papers, calendars (that had expired), and obnoxiously big magnets about how to feed your infant (we are so past that). There were also things on my fridge that I couldn't see. Character qualities that I want to instill in my children, recipes and crafts I want to try, truths I need to remember daily, and even Caleb's chore chart. I threw away several things... outdated papers, expired coupons. 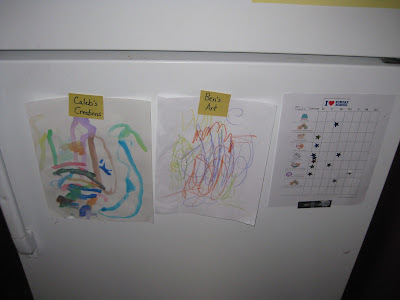 I put away baby-related reminders that I don't need (right now). I also got rid of the loud magnets... You know the kind. 3D. Strange colors. Annoying sayings. I can't handle those. Plus, I found places for all the objects that were on top of the refrigerator. Sigh... that felt good. Then I made some magnets by gluing small signs on old magnets so that they all matched. Sad how happy that made me. Then I intentionally arranged things to be in places where the users would need them. Chore chart way down low. My recipes way up high where small hands don't claim them for a snack (my baby is a paper eater). These are the things I need to see. These are the things my kids want to see. And just in case you love this, click over here. 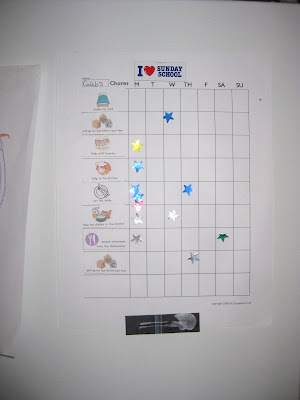 This is a great preschool chore chart. Caleb has a lot of enthusiasm for helping with things around the house, and the star stickers are an added bonus. Plus, the chart is a good reminder for me to ask Caleb for help because it teaches him valuable skills and eventually it will save me time. More on the other projects I tackled another day! There's a game of Go Fish waiting! What's the book you said you wanted?...about this stuff? 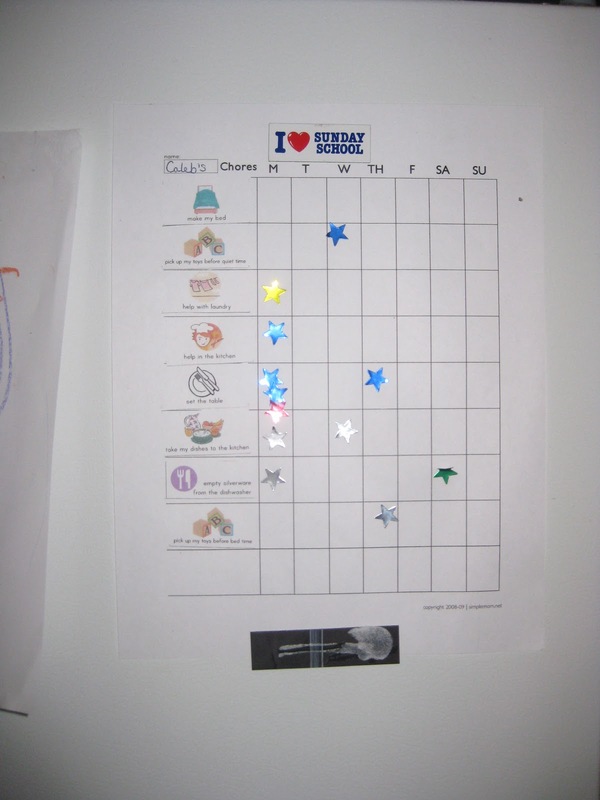 I seriously don't understand how you got that chore chart to print like that. It's tiny on my screen.